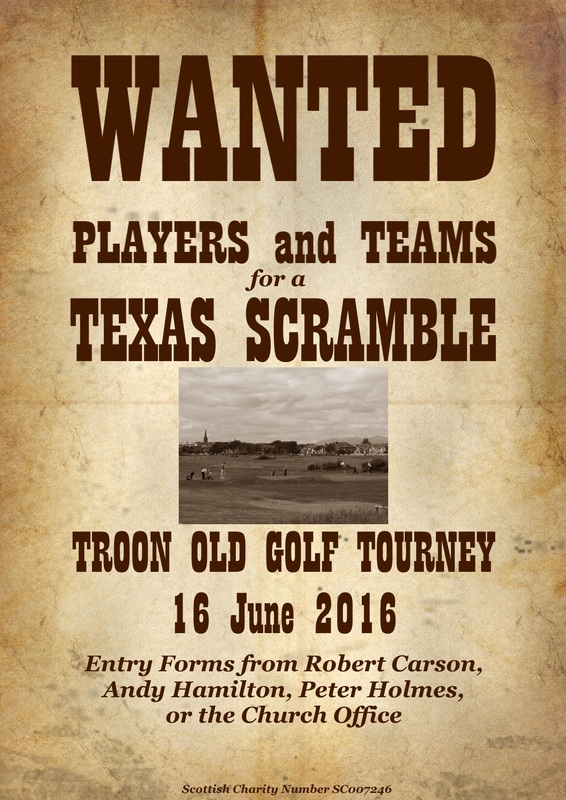 The annual Troon Old Golf Tourney will be held on Thursday 16th June on the Fullarton course. 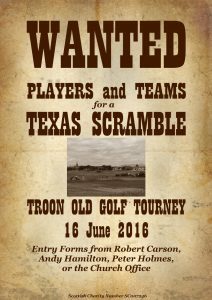 This year the competition again takes the form of a Texas Scramble. Never heard of a Texas Scramble? It’s a team event for teams of 3 or 4. Each player plays his or her own ball, but plays their second and successive shots from the same spot the “best ball” landed the previous shot. So, having taken advantage of all the best shots en route to the pin, the team then records a single score for the hole. That’s it in a nutshell. There are a couple of other subtleties, but don’t worry, these will be explained on the day. Form a team of your own or speak to Robert Carson to join a team. Tee times are reserved from 3 pm to 4:30 pm (you can indicate your preference on the entry form). Click here to download your entry form. Please return it to the Church Office, Robert Carson, Andy Hamilton, or Peter Holmes no later than Sunday 12th June. Following the competition, due to the ongoing renovation of the Welbeck clubhouse, the purvey and prizegiving will take place back in the Church Halls at 7:30 pm. Note that there is a separate Stroke Play Competition for the trophies this year.